AppManager gives you the tools you need to keep a firm grip on network operations. As your organization grows, it invariably takes more resources to keep things running smoothly. The IT infrastructure you have to manage and support becomes increasingly complex. More users, systems, and servers are added to the network—all that equates to more issues you'll need to resolve. Your users won't always use their applications and network resources correctly. There will be software conflicts with the operating system or other applications. Newly released software is often loaded with bugs that can cause dramatic problems like crashing your applications and servers or subtle issues like memory leaks that continuously rob your servers' memory resources. If you're in a small organization with one or two servers, you might be able to deal with these issues as they arise without much support. As your systems get larger, this task quickly becomes daunting. NetIQ has your answer to this dilemma with its AppManager suite. AppManager lets you monitor your Windows clients and servers, as well as any Unix systems you may have attached to your network. The sheer number of different technological assets that you can monitor with AppManager is impressive to say the least (see Figure 1). 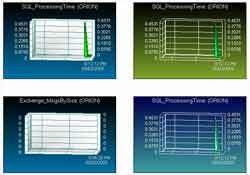 The tree view on the left of Figure 1 shows the various categories of objects you can monitor. The detail pane on the right displays objects for the NT category. AppManager can monitor processes that burn up the most CPU time, watch how a server is performing in terms of streaming media and watch your Exchange servers and SQL servers. It could easily become an indispensable part of your network maintenance and troubleshooting toolbox. If you've used NetIQ's AppAnalyzer, you will already know that NetIQ does a fantastic job of helping you determine if your systems meet the requirements. AppManager uses the same concept by providing you with an application for checking system requirements prior to installing AppManager. Although the requirements listed above seem relatively simple to verify, there are "hidden" requirements that the system check utility will help you uncover. When installing any of AppManager's components, you'll have the option to perform a system pre-installation check prior to installing the full product. Depending on which components you choose to install, you may be asked to select sub components as well. These subcomponents will determine the nature of the checks that AppManager will perform on your systems. 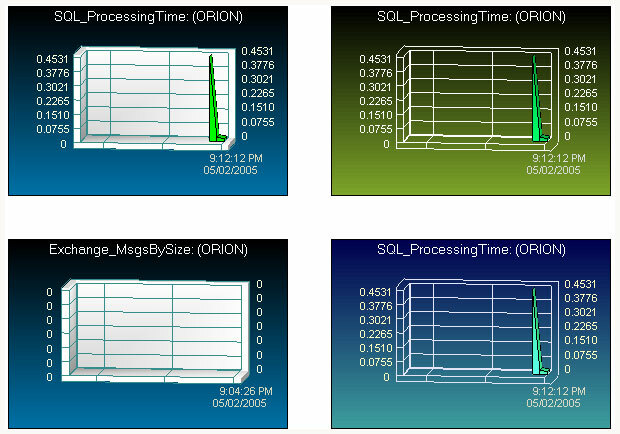 In Figure 2, you can see an example of results returned from a Pre-installation check for the Analysis Center install. 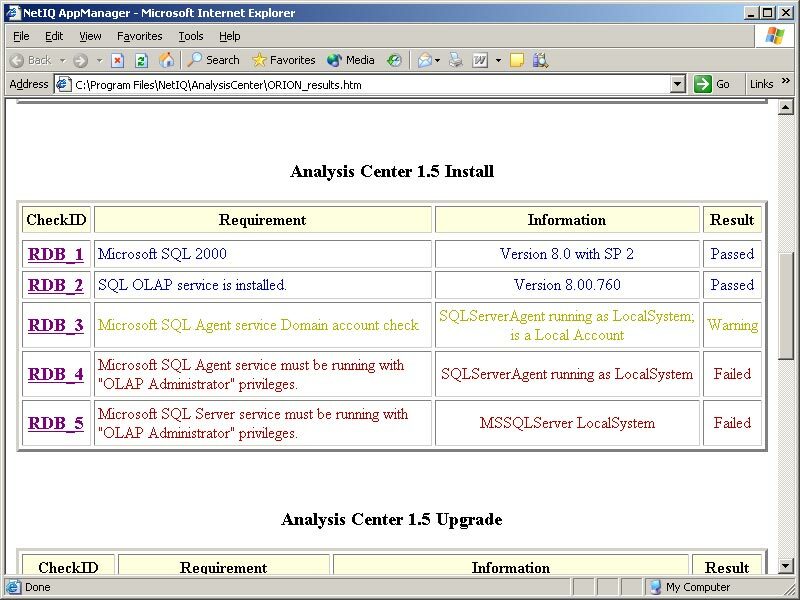 Note the issues with the SQL Agent and Server running as OLAP Administrators. Once you've resolved any pre-installation issues that arise, you'll be ready to install the product. Resist the temptation to forgo this step. If you don't perform a pre-installation check, you may find issues later on that prevent the product from working correctly. NetIQ has provided the pre-install checks to help ensure a smooth installation and operation of AppManager. 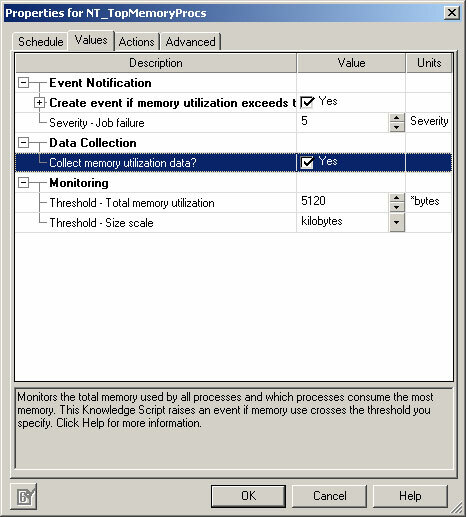 This particular Knowledge Script is configured to monitor the processes that are using the most memory. Using this script, you can determine if an application or applications are using excessive amounts of memory or if an application is using more memory than it calls for. You could use this Knowledge Script to help you locate apps with memory leak issues. Another well-thought-out and useful feature is the ability to simultaneously apply the same Knowledge Script to multiple computers. The Operator Console displays all the computers that you've configured for that particular script. At the top of the tree view is the master object. Once you've located the Knowledge Script you want to apply to a group of computers, simply drag the script to the master object. 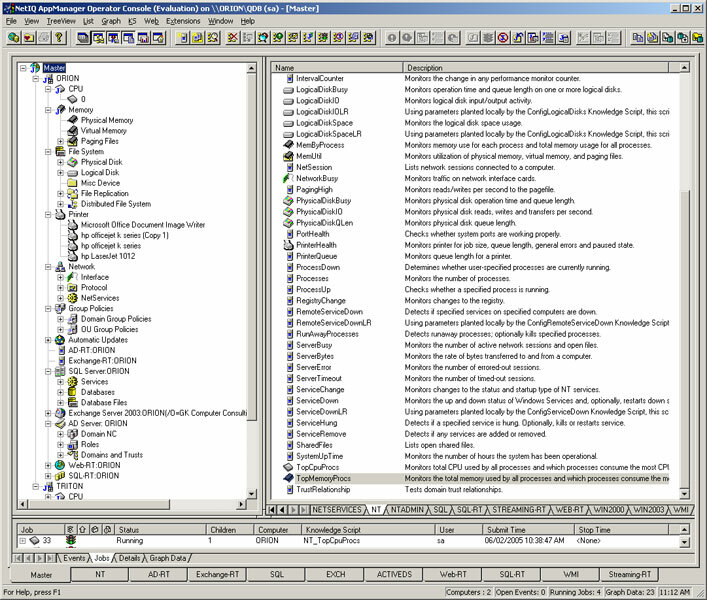 AppManager will apply that script to all the computers in the tree view, highlighting the appropriate options in those computers and applying the jobs to all computers in one operation. The Operator Console is where you'll do most of your configuration and monitoring tasks. AppManager lets you run the Operator Console as an MMC snap-in or even remotely with web-based interface (see Figure 4). The ability to run the console from multiple interfaces lets you connect to your management server remotely whether in the office or on the road. After you've configured and run a set of Knowledge Scripts to gather monitoring data, you can then view the information in a number of different chart formats. 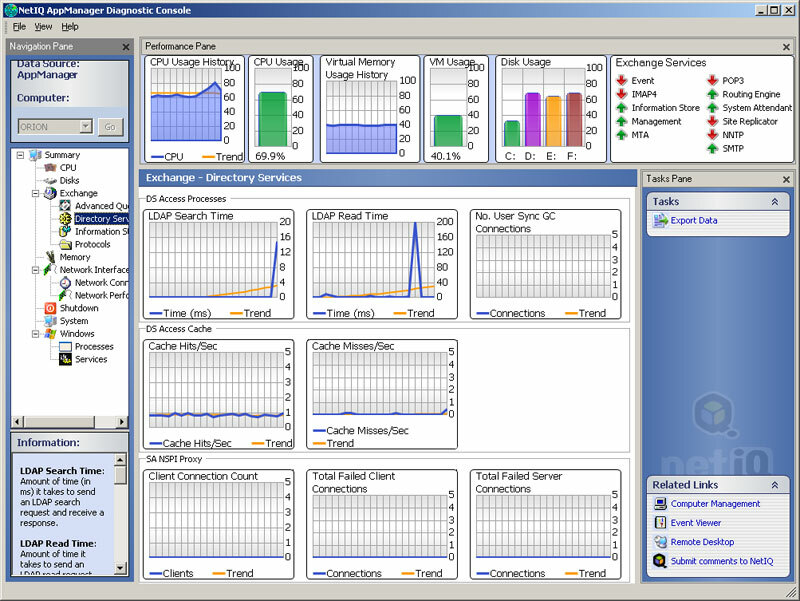 The bottom pane of the Operator Console displays the Events, Jobs, Details and Graph Data tabs. Selecting the Graph tab will give you the option of producing charts for graphically displaying job results. 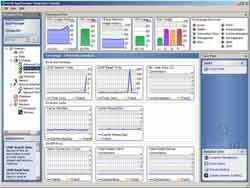 AppManager offers several preconfigured themes for these charts. As you can see in Figure 5, you can view multiple charts in the Charting Console to see multiple job results in a single view. ith the Analysis component installed, you can also use OLAP to view and manipulate your data. For this to function correctly, you must first install SQL Server Analysis on a server accessible to AppManager and its Analysis services. Installing Analysis Services on the same computer as AppManager and the repository will tax your system, so make sure you have the resources to handle both. The recommended approach is to install SQL Server on a separate system to reduce the server load. AppManager also includes a Diagnostic Console utility, which gives you a snapshot of how a computer is using its resources. The Diagnostic Console ( Figure 6) gives you much of the same information you're used to seeing in the Windows Task Manager. There are several panes in the Diagnostic Console that give you select snapshot data. The performance pane at the top gives you real time CPU, memory and disk usage. The top right pane shows you the status of your Exchange services. The lower left pane displays information about each graph, and the lower right pane lets you get at commonly used system utilities. You can export the Diagnostic Console data to an HTML summary. If yon need to perform some monitoring tasks that aren't provided out of the box, AppManager lets you create and customize scripts yourself. You can use the script editor or the Developers Console to view, create, customize and edit Knowledge Scripts. Some of the scripts are written in Microsoft Visual Basic Script, which uses the same syntax you may have already used if you've done scripting for WMI or ADSI. You can also import existing PERL scripts into the Developer Console to create custom Knowledge Scripts. As you might expect from an application of this scale, there are some hefty system requirements. Although not big on hardware horsepower, you'll need to satisfy software requirements. AppManager requires a repository server and a management server at the very least (although these can both be the same server, if needed). You will need a Pentium III 733MHz CPU, 512MB RAM and 200MB of hard disk space at a minimum. 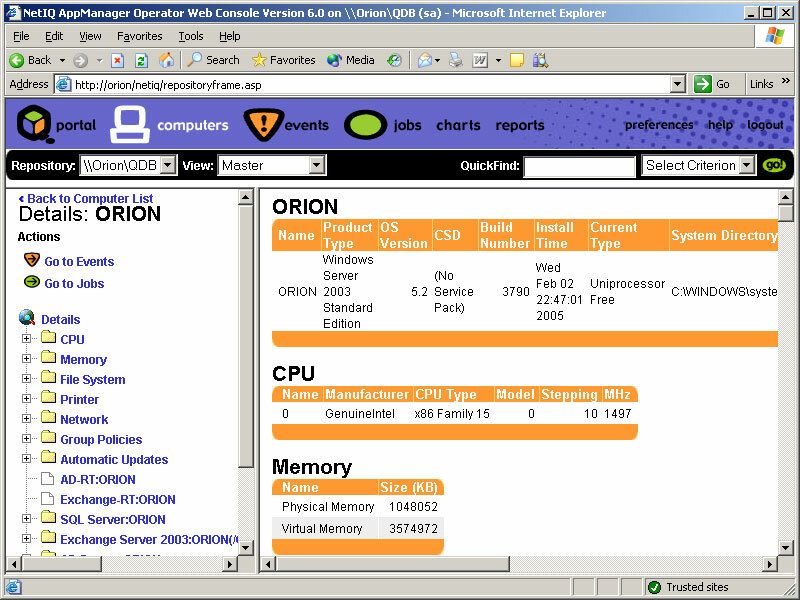 You'll also need Windows 2000 SP3 or Server 2003 as the base operating system. The repository server needs access to Microsoft SQL Server 2000 SP3 or later with MDAC 2.6 or 2.7. If you want to run the analysis component, you will also need to install SQL Server Analysis Services on your database server. Believe it or not, we have merely scratched the surface here of what you can do with AppManager. We could easily fill this magazine with more descriptions of what AppManager can do. The User's Guide for the product itself is 358 PDF pages long. Add the Administrator's guide, the Installation Guide, the Knowledge Script Reference Guide, Upgrading Guide and Reporting Guides, and you can easily fill your summer reading list. It will require some time on your part to learn all of AppManager's features, but you'll earn it back with the time saved monitoring multiple computers. AppManager may provide more tools and utilities than you may need, but it's better to have more than less in this case.